We’ve gathered together some of the places most associated with the bard, so you can plan your own pilgrimage and celebrate the enduring influence of Britain’s greatest writer. From Stratford-upon-Avon to the Scottish Highlands, enjoy a whistlestop tour of the places that shaped the life and legacy of William Shakespeare and where you can celebrate Shakespeare. Why go? In April 1564, in a half-timbered wattle-and-daub house on Henley Street, William Shakespeare entered the world. And almost ever since, this comely Warwickshire town has been, unofficially, Shakespeare-upon-Avon. For centuries tourists have flocked here to commune with the bard; an original window pane from the house bears graffiti by past visitors including Charles Dickens, John Keats and Walter Scott. Incredibly, given its historical import, by the beginning of the 19th century Shakespeare’s Birthplace had fallen into disrepair. However, following a fundraising campaign – supported by Dickens – the house was purchased for the nation in 1847. Today it’s a museum that aims to recreate Will’s world: his father’s glove workshop, the bedchamber in which he was born, the Tudor herb garden. The latter is where resident theatre troupe Shakespeare Aloud! perform scenes on request. A walking tour of Stratford reveals further Shakespeare links. From the birthplace, walk down Henley Street and turn right onto High Street to pass the former home of Judith, Will’s daughter; Nash’s House, home to his grandson-in-law and near the site of New Place, his grand house (demolished in 1759); and the King Edward Grammar School, where he studied. A left onto Old Town leads via Hall’s Croft, home of Shakespeare’s daughter, Susanna, to Trinity Church, wherein lies Shakespeare’s grave. Why go? The Globe, erected on the south bank of the River Thames in 1599, was one of the first purpose-built playhouses in London. It burnt down in 1613, when a canon ball fired during a production of Henry VIII ignited its thatch. It was quickly reconstructed, but demolished again in 1644, to make way for cheap housing. 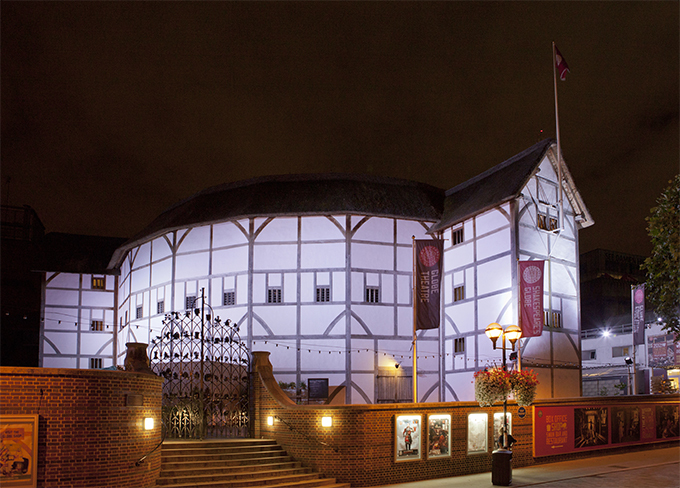 However, in 1997 the Globe rose again, an oak-lath and lime-plaster reconstruction of the polygonal theatre, built just 230m from the site of the original. As in Shakespeare’s time, the auditorium is roofless; the yard in front of the stage is open to the elements and standing-only; the tiered galleries are sheltered, with wooden bench seats. 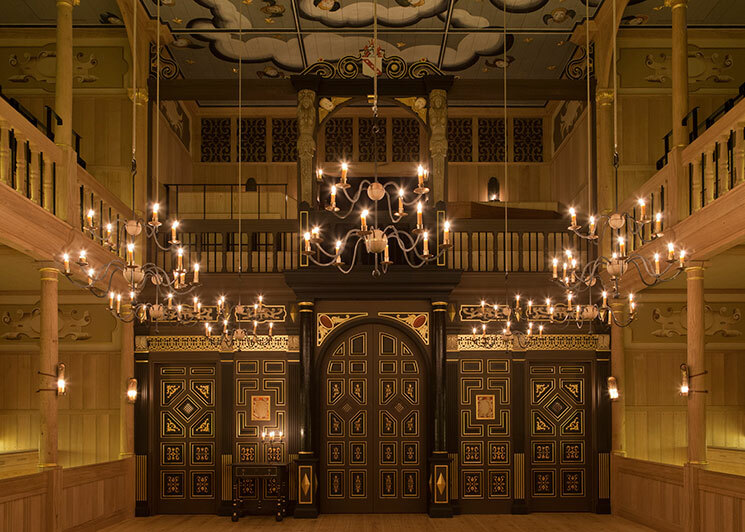 In January 2014 the Globe became a year-round venue with the opening of a Jacobean-style indoor theatre, the Sam Wanamaker Playhouse, alongside its open-air playhouse, with performances atmospherically staged by candlelight. (King Lear, Act 4, Scene 1). The blinded Earl of Gloucester is not in a happy place when he stands atop the iconic White Cliffs of Dover, on the very edge of Britain. Shame, because they are a spectacular lookout. One particular precipice has been named Shakespeare Cliff, and from its chalky summit you can enjoy views over Samphire Hoe, Dover harbour and the Channel; mainland Europe looms, just a few miles away. Why go? In Shakespeare’s As You Like It, the Forest of Arden is a simple, idyllic realm, free from the corruptions of court. Located to the north of Stratford-upon-Avon, the real forest was the woodland of William’s childhood, helping to inspire his love of nature. The area had been largely deforested even by Shakespeare’s time; today, even fewer trees remain but its pastoral character can still be felt in the scattered oaks (around 500 of which are more than 300 years old), small copses and roadside hedgerows. The villages have a bucolic character too: visit Wilmcote, home to the cottage of Mary Arden (Shakespeare’s mother); Henley-in-Arden, with its largely half-timbered High Street and medieval market cross; and Alcester, which has several fine Tudor buildings and hosts the Forest of Arden Food Festival every May and October. Why go? Rufford Old Hall was built for Sir Robert Hesketh in around 1530 and is one of the finest Tudor piles in Lancashire. Its crowning glory is the timber-framed Great Hall, which contains a dramatic hammerbeam roof, an exquisitely carved 16th-century screen – and a potential explanation for Shakespeare’s ‘lost years’. It’s believed that a young, pre-famous Shakespeare – named in records as ‘William Shakeshafte’, a common alternative spelling – was teaching nearby in Preston in the 1580s (possibly exiled from Stratford after being caught poaching); he later joined a company of players that performed for the Heskeths in the Great Hall. Visitors today can admire Rufford’s impressive armour collection and 17th-century tapestries, and tread the very flagstones where Will once walked. Why go? Shakespeare was bound most closely to two places – Stratford and London – and journeyed between them many times. No one knows exactly which route he took, but the 146-mile Shakespeare Way, which links his birthplace to London’s Globe Theatre, is a most-scenic best-guess. The trail, created in 2006 to raise money for the Shakespeare Hospice, traverses the heart of England, winding via the Cotswolds, Blenheim Palace and the Thames. Some stops, such as Oxford, were certainly on Will’s route – he reputedly stayed at the Crown Tavern on Cornmarket Street, a remnant of which (currently off-limits, but in the care of the Oxford Preservation Trust) sits inauspiciously above a clothes store, next to a betting shop. But the whole route – accurate or not – showcases the landscapes that helped inspire his words. Why go? The Willow Globe takes Shakespeare back to nature. This unique theatre in mid-Wales, a third the size of London’s Globe, is constructed amid the lush surrounds of the Upper Wye Valley from living willow trees, which are carefully woven into the most magical auditorium. It’s a surreal and secretive dell where it’s easy to imagine Titania and Oberon dancing betwixt the boughs and where Shakespeare’s plays truly come to life. Why go? The Merry Wives of Windsor is the only comedy Shakespeare set in England – the action plays out around Windsor Forest. It’s here that the irreverent Falstaff eventually gets his comeuppance under an old tree said to be haunted by Herne the Hunter, a legendary antlered phantom who hanged himself from its branches. The real Herne’s Oak was destroyed in 1796, but it’s thought to have stood somewhere near 17th-century Frogmore House, a royal retreat in the Home Park area. No matter, the rest of Windsor Great Park, a 5,000-acre deer park dating back to the 13th century, is worth exploring anyway: spend a whole day strolling the arrow-straight Long Walk from the castle gates to the King George III statue, sniffing the blooms in elegant Savill Gardens and strolling the south shore of Virginia Water, home to a Chinese temple. Why go? True, none of Will’s heroines actually wafted along the sweeping sands of Holkham. But in 1998’s Shakespeare in Love, this beautiful north Norfolk beach stole the show, the movie’s final shot panning up from Gwyneth Paltrow’s Viola striding out to the distant sea at low tide. It’s a setting worthy of Shakespeare: seemingly endless golden sands, under big Norfolk skies, backed by pines and speckled by shells and pink-footed geese – perfect for a dramatic stroll. Why go? There’s no evidence that Macbeth was the tyrant portrayed by Shakespeare. Indeed, in 1050 the real-life king Mac Bethad mac Findlaich made a pilgrimage to Rome – not the act of a ruler worried about the stability of his position. So, as Shakespeare blurred fact and fiction, so should a good Scottish Macbeth Tour. The play’s villain was named Thane of Glamis, so a visit to the elegantly turreted Glamis Castle, near Forfar, seems appropriate; in the oldest part of the castle is a room called Duncan’s Hall, named after the king Macbeth killed – though it was built 400 years after the historical event. Likewise, although Macbeth was subsequently named Thane of Cawdor, Cawdor Castle wasn’t built until the 14th century – though it still makes a romantic detour, with its Flemish tapestries, rock-hewn kitchen and 16th-century walled garden. However, truth-seekers should head for the village of Lumphanan, in Aberdeenshire. It was here, in 1057, that the real Macbeth was killed in battle; a stone, just outside the village, marks the spot. After paying your respects, raise a whisky to the maligned man at Lumphanan’s MacBeth Arms Hotel.